Ball or stuffed toy — Do dogs ‘know’ what they’re smelling? Ball or stuffed toy -- Do dogs 'know' what they're smelling? Dogs' excellent sense of smell is well-known, whether it is in the context of searching for people or for contraband substances. However, the question of how dogs understand what they perceive with their sense of smell has largely been unexplored. 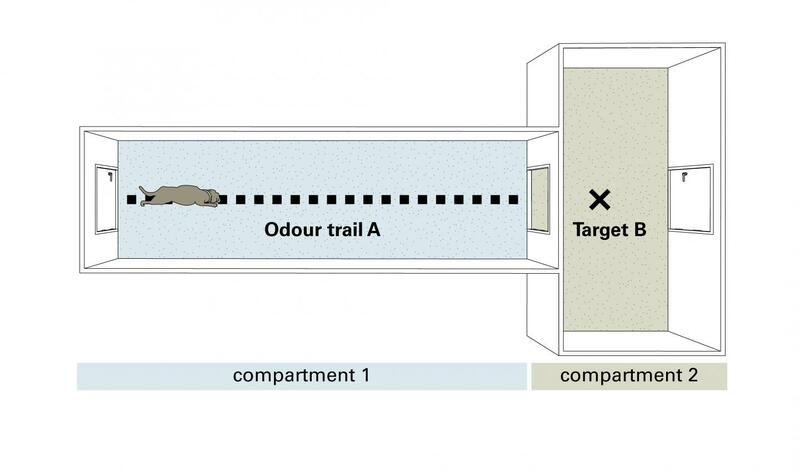 In a study published today in the Journal of Comparative Psychology, scientists at the Max Planck Institute for the Science of Human History and the Department for General Psychology and Cognitive Neuroscience (Institute of Psychology) at Friedrich Schiller University of Jena, investigated this question and found evidence that dogs create a "mental representation" of the target when they track a scent trail. In other words, they have an expectation of what they will find at the end of a trail. In total, study director Dr. Juliane Bräuer and her staff tested 48 dogs, 25 of whom had training with the police or a search and rescue team and 23 of whom were family dogs without special training. The tests were carried out with the financial support of the Swiss Albert Heim Foundation in the Dog Studies group of the Max Planck Institute for the Science of Human History. The dogs first underwent a pre-test, in which two toys were identified for each dog that he or she liked to retrieve. In the test itself, each dog underwent four trials in which he or she followed a scent trail that was drawn with one of the two toys. At the end of the trail, the dogs found either the toy with which the track had been laid (the normal condition) or the dog found the other toy (the surprise condition). Half of the dogs in the first round were given the normal condition, and the other half were given the surprise condition. The behavior of the dogs was filmed during all test runs. "From my experience in other studies, I had assumed that the surprise would be measurable, in that the dogs would behave differently in the surprise condition than they would in the normal condition," Dr. Bräuer explains regarding her study approach. "In fact, quite a few dogs showed interesting behavior, especially in the first round of the surprise condition, which we called 'hesitation:' although they had obviously noticed the toy, they continued to search via smell, probably for the toy that had been used to lay the scent trail." However, this "surprise effect" disappeared in the subsequent test runs. This could be because the dogs, no matter which toy they found, were rewarded by playing games, or because the room still smelled of the toys from the previous test runs, despite having been cleaned. According to Dr. Bräuer's assessment, the results of the first round of testing are nevertheless an indication that dogs have a mental representation of the target object when tracking a scent, which means that they have a concrete expectation of the target. "The comparison between working dogs and family dogs was also interesting," adds Dr. Bräuer. Although the police and rescue dogs were expected to and did indeed retrieve the objects faster than the family dogs in the first round, within four rounds the two groups retrieved the toys equally quickly. Further studies should help to clarify the exact connection between smell perception, search behavior and cognition. For more information about Juliane Bräuer's research, please visit the Dog Studies website: https://doglab.shh.mpg.de/dog-cognition.php. Dying for the group: What motivates the ultimate sacrifice?